Attention: Satisfactory is a game found in Early Access and is only available in the Epic Game Store, not being available in Steam. Therefore, any Satisfactory key or cd that is purchased at another store other than the official Epic Game Store, must be redeemed in our account on this platform to proceed with the download of the game. 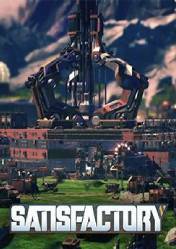 Satisfactory is a first-person open world factory building game with touches of exploration and combat. We will be in charge of exploring and exploiting a distant alien planet, through the implantation of factories. But these planets are not without dangers, we must defend our constructions of the native life of each planet. Our goal will be to create multi-storey factories, reach the sky of the conveyor belt, automate vehicles and research new technologies. An original game for Epic that mixes the genre of resource management and administration, manufacturing processes and survival elements. I have seen this game in YouTube videos and really want it. The graphics look really cool and I have OCD which this game is perfect for. I liked Subnautica but when I saw this game I just fell in love with it. This game is totally for those who like automating item farming. It also runs pretty good on most gaming computers. U can always trim the graphics settings.